Two independent teams of astronomers have uncovered convincing evidence that three young planets are in orbit around an infant star known as HD 163296. Using a new planet-finding strategy, the astronomers identified three discrete disturbances in a young star's gas-filled disk: the strongest evidence yet that newly formed planets are in orbit there. Over the past several years, the Atacama Large Millimeter/submillimeter Array (ALMA) has transformed our understanding of protoplanetary disks—the gas- and dust-filled planet factories that encircle young stars. The rings and gaps in these disks provide intriguing circumstantial evidence for the presence of planets. Other phenomena, however, could account for these tantalizing features. Using a new planet-hunting technique that identifies unusual patterns in the flow of gas within a protoplanetary disk, two teams of astronomers have confirmed the distinct, telltale hallmarks of newly formed planets orbiting an infant star in our galaxy. These results are presented in a pair of papers appearing in the Astrophysical Journal Letters. "We looked at the localized, small-scale motion of gas in a star's protoplanetary disk. This entirely new approach could uncover some of the youngest planets in our galaxy, all thanks to the high-resolution images coming from ALMA," said Richard Teague, an astronomer at the University of Michigan and principal author on one of the papers. To make their respective discoveries, each team analyzed the data from various ALMA observations of the young star HD 163296. HD 163296 is about 4 million years old and located about 330 light-years from Earth in the direction of the constellation Sagittarius. Rather than focusing on the dust within the disk, which was clearly imaged in earlier ALMA observation, the astronomers instead studied the distribution and motion of carbon monoxide (CO) gas throughout the disk. Molecules of CO naturally emit a very distinctive millimeter-wavelength light that ALMA can observe. Subtle changes in the wavelength of this light due to the Doppler effect provide a glimpse into the kinematics—or motion—of the gas in the disk. If there were no planets, gas would move around a star in a very simple, predictable pattern known as Keplerian rotation. "It would take a relatively massive object, like a planet, to create localized disturbances in this otherwise orderly motion," said Christophe Pinte of Monash University in Australia and lead author on one of the two papers. "Our new technique applies this principle to help us understand how planetary systems form." The team led by Teague identified two distinctive planet-like patterns in the disk, one at approximately 80 astronomical units (AU) from the star and the other at 140 AU. (An astronomical unit is the average distance from the Earth to the Sun, or about 150 million kilometers.) The other team, led by Pinte, identified the third at about 260 AU from the star. The astronomers calculate that all three planets are similar in mass to Jupiter. The two teams used variations on the same technique, which looked at anomalies in the flow of the gas—as seen in the shifting wavelengths of the CO emission—that would indicate it was interacting with a massive object. Teague and his team measured variations in the gas's velocity. This revealed the impact of multiple planets on the gas motion nearer to the star. Pinte and his team more directly measured the gas's actual velocity, which is a better for studying the outer portion of the disk and can more accurately pinpoint the location of a potential planet. "Though thousands of exoplanets have been discovered in the last few decades, detecting protoplanets is at the frontier of science," said Pinte. The techniques currently used for finding exoplanets in fully formed planetary systems—such as measuring the wobble of a star or how a transiting planet dims starlight—don't lend themselves to detecting protoplanets. 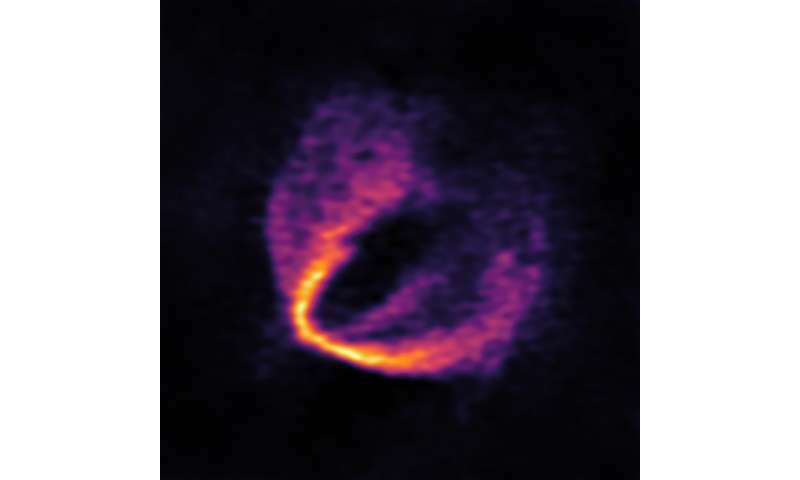 ALMA's stunning images of HD 163296 and other similar systems have revealed intriguing patterns of concentric rings and gaps within protoplanetary disks. These gaps may be evidence that protoplanets are plowing the dust and gas away from their orbits, incorporating some of it into their own atmospheres. 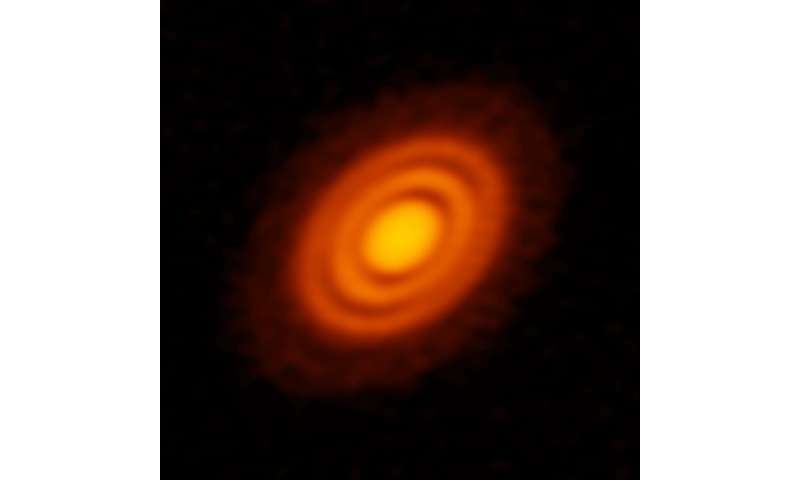 A previous study of this particular star's disk shows that the dust and gas gaps overlap, suggesting that at least two planets have formed there. These initial observations, however, merely provided circumstantial evidence and could not be used to accurately estimate the masses of the planets, noted Teague. "Since other mechanisms can also produce ringed gaps in a protoplanetary disk, it is impossible to say conclusively that planets are there by merely looking at the overall structure of the disk," he said. ALMA has uncovered convincing evidence that three young planets are in orbit around the infant star HD 163296. Using a novel planet-finding technique, astronomers have identified three discrete disturbances in the young star's gas-filled disc: the strongest evidence yet that newly formed planets are in orbit there. These are considered the first planets discovered with ALMA.This image shows part of the ALMA data set at one wavelength and reveals a clear 'kink' in the material, which indicates unambiguously the presence of one of the planets. Credit: ESO, ALMA (ESO/NAOJ/NRAO); Pinte et al. The key to a more conclusive detection, note the astronomers, lies in teasing out the fine-scale velocity signatures from the carbon monoxide gas. "Although dust plays an important role in planet formation and provides invaluable information, gas accounts for 99 percent of a protoplanetary disks' mass," said coauthor Jaehan Bae of the Carnegie Institute for Science. "It is therefore crucial to study kinematics of the gas." Light that a gas emits from a protoplanetary disk changes its wavelengths depending on the gas's relative motion to Earth due to the Doppler effect. 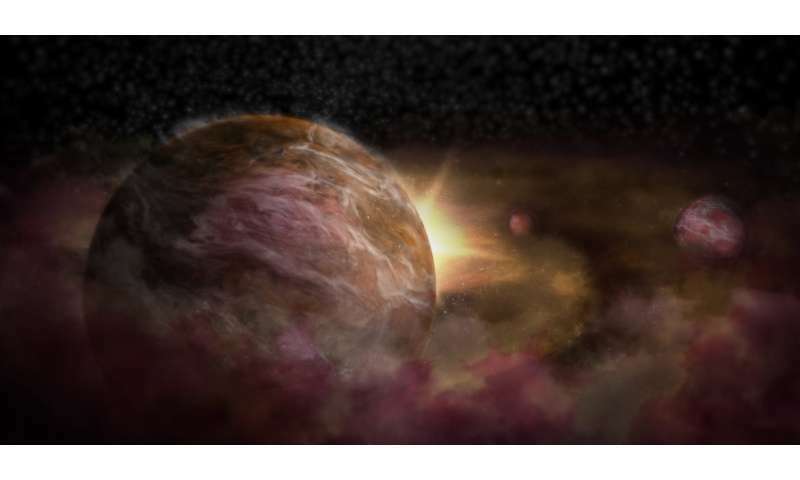 "This is analogous to the Doppler technique used for finding fully formed planets," said coauthor Dan Foreman-Mackey of the Flatiron Institute. "Though rather than looking at the changes in wavelength from the wobble of the star, we're diving deep into the disk to see how the fine-scale changes are happening." ALMA's fantastic resolution enabled the researchers to measure carbon monoxide's velocity patterns throughout the disk. "The precision is mind boggling," said coauthor Til Birnstiel of the University Observatory of Munich. In a system where gas rotates at about 5 kilometers per second, ALMA detected velocity changes as small as a few meters per second. "This allows us to find very small deviations from the expected normal rotation in a disk," Teague said. Planets change the density of the gas near their orbits, which changes the gas's pressure, inducing these corresponding changes in velocity. "We compared the observations with computer models to show that the observed flows fit beautifully with predictions for the flow pattern around a newborn planet a few times the mass of Jupiter," said coauthor Daniel Price of Monash University. This new technique allows astronomers to more precisely estimate protoplanetary masses and is less likely to produce false positives. "We are now bringing ALMA front and center into the realm of planet detection," said coauthor Ted Bergin of the University of Michigan. "Oftentimes in science, ideas turn out not to work or assumptions turn out to be wrong. This is one of the cases where the results are much more exciting than what I had imagined," Birnstiel said. "These studies will also help us to understand how planets like those in our solar system were born," said coauthor Francois Menard from Grenoble University in France. Both teams will continue refining this method and will apply it to other disks, where they hope to better understand how atmospheres are formed and what elements and molecules are delivered to a planet at its birth. This research was presented in two papers to appear in the same edition of the Astrophysical Journal Letters. The first is entitled "Kinematic evidence for an embedded protoplanet in a circumstellar disc", by C. Pinte et al. and the second "A Kinematic Detection of Two Unseen Jupiter Mass Embedded Protoplanets", by R. Teague et al. Whoa! We get to watch the cthonic dust bunny deities create new worlds. How cool is that! We don't need science to indicate how the planets were formed! The great spaghetti monster god made them out of giant meatballs. It says so right here in the holy pasta. Planets are what is left of Giant Burnt Meatballs after the Refrigerator Fungus gets done with them, time passes and the minerals that composed the Giant Meatball will layer out with the metals quickly sinking through what is left of the Red Sauce, also known Terrestrially as Magma to the Center. Many other elements layer out in much the same way that Pastafarians say resembles that of Lasagne. Others will disagree saying that the upwelling of Redsauce in Plumes can totally disrupt the Lasagne-Layering process, however, Geologists tell us that the layers are most certainly there, giving firm substance to the Pastafarian Claims. The Refrigerator Fungus is also the cause of higher life forms, once the Giant Meatball has been mostly consumed, competition drove life to first get on land, as meat eating plants, and then follow, as meat eating insects and fish-waddlers. Once all the Meatball was eaten up or rotten away, the animals had a choice: Eat Plants, or each other, so they did.